Nadia lives on the road full-time with her husband, Jon. She dreams of traveling the world, creating inspiring content, and hugging a koala bear. She writes for various blogs and magazines, also documenting their adventures on the blog RoamingRemodelers. Wanting to do something truly epic to remember our trip by, we chose whitewater rafting as the centerpiece of our trip. 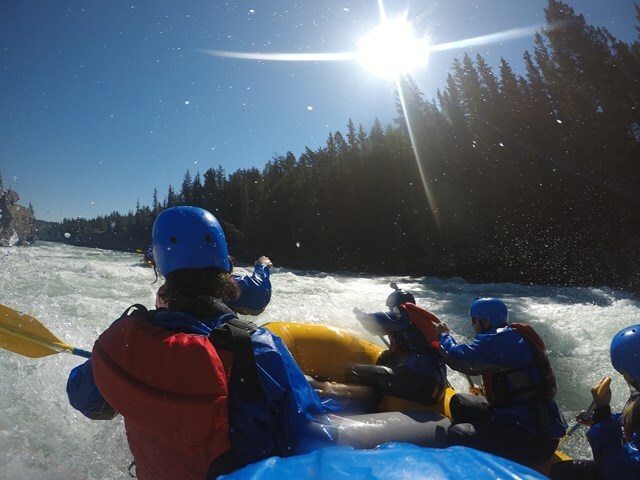 We chose Chinook Rafting because their Riverbase meeting point was just 45 minutes away from where we were staying in Calgary. We were very interested in the Horseshoe Canyon Tour because that tour includes up to Class 4 rapids. We were hoping for a thrill without sacrificing too much sleep. A 45-minute drive struck us as the perfect balance given the 8:15 a.m. start time of the Horseshoe Canyon tour. Along our drive to the meeting point, we realized that we weren’t exactly sure what to wear or how cold the water might be. Luckily, upon arrival, friendly Chinook guides gathered us all in a circle and assured us that we all had the same questions and they were ready to answer them all. As it turned out, ready and waiting for us were wetsuits, booties, optional fleece pullovers, rain jackets, PFDs, and helmets (complete with GoPro mounts!). Worrying was unnecessary as Chinook took care of all the details. All of the gear was available in a variety of sizes, ensuring we would all be safe and warm out on the river. Our guides all had a great sense of humor. The info session regarding our gear was just as entertaining as it was informative, and this continued on as we were loaded up onto yellow school buses to reach our rafts. Descending in full gear from the buses, we all gathered around to learn about proper safety precautions and rescue instructions for whitewater rafting. We broke up into rafting groups of 8 and went over rafting instructions and techniques with our own guide. Once in the raft, we practiced “forward paddle”, “backward paddle”, and “lean in”. Waiting just around the first bend for us was our first rapid, a Class 4. Before we knew it, we’d splashed and paddled through our first rapid. No longer nice and dry, but also no longer nervous, we all felt quite accomplished. We’ve got this! 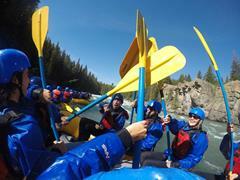 It felt good to continue rafting down the river with newfound confidence, and feeling quite a bit lighter. With a Class 4 rapid under your belt, why not try a little cliff jumping? Everyone paddled to shore and left their rafts for an optional cliff jump. A medium and high cliff jump awaited anyone looking for additional thrills. In our particular group, the wives chose the medium cliff jump, watching the husbands jump off the higher cliff into the rushing river below. Most surprising was how nice and warm we all still felt, in spite of having been completely immersed in the frigid river. We couldn’t have been happier with the quality of the gear we received. We paddled through some more rapids, eventually arriving at a calm stretch of the Bow River. The calm stretch of water allowed us to really soak in the beauty of the Canadian Rockies surrounding our raft. Alex, our guide, pointed out spots along the way where Hollywood movies such as The Revenant and Legends of the Fall were filmed. Alex also explained why the waters appeared the beautiful, vivid shade of blue-green we were seeing. We also learned a bit about the history of the area. The calmer waters also allowed us to interact with the other Chinook rafts in the morning’s tour, splashing cold water at one another. 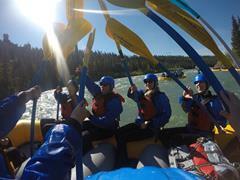 Aside from our fellow Chinook rafters, we had the river and its surrounding beauty to ourselves. Before we knew it, we were back at our meeting point. On the bus ride back we were excited to learn that snacks and hot coffee and tea were ready and waiting for us. Another bonus was a slideshow containing pictures the guides had taken while we were rafting and cliff jumping. For some of us on this ultimate friends’ Canadian road trip this was our first time rafting, and this bonded us further. Whitewater rafting was the perfect combination of adventure and nature, giving us road trip memories we won’t soon forget.